FREE Women’s Snowflake Slipper Socks! You are here: Home / Great Deals / Christmas Deals / FREE Women’s Snowflake Slipper Socks! 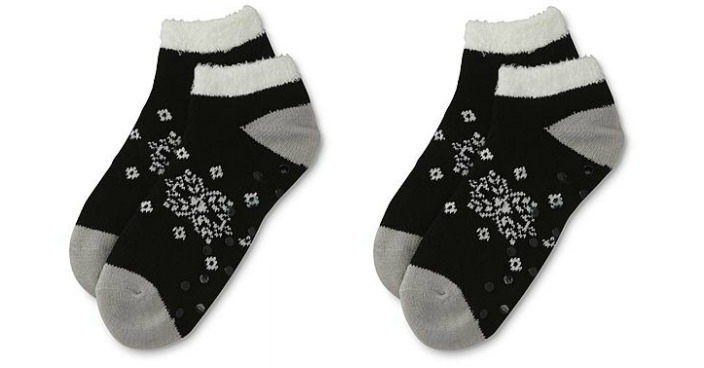 Sears has these Women’s Snowflake Slipper Socks on sale for $4.99 (Reg. $12) and you can get back $5.04 in Shop Your Way points, making it FREE! Every step feels better than the last in these women’s slipper socks from Studio S. Crafted from knit with a wintry snowflake pattern, these ankle socks feature the soft comfort of a plush lining that offers a warm feeling of comfort and joy. Non-slip grippers on the soles lend safety.